The Pollydopolipt are a race developed from an ancestor similar to terrestrial sea urchins. A unique ability they possess is limited polymorphism. 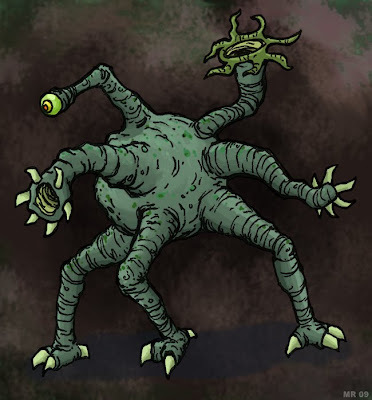 Specific organs in the creature's limbs allow it to form tools such as visual, audio, and tasting organs, grasping digits, or defensive weapons. Pollydopolipt culture includes an advanced fighting system, of which takes many, many years to master. This martial art focuses on quickly forming weapons such as claws, bladed thorns, or pincers and attacking at multiple angles. The masters of this unpredictable fighting system are considered among the best hand-to-hand fighters in the galaxy.